How Far is Teak Meadows? Teak Meadows – You can literally watch your investment grow Land is often the best investment as its one thing we cannot make more of. But not only are these plots good for your pockets, but for your health too. With 40 feet height teak trees, you’ll be breathing nothing but fresh,clean air that’s really good for you. 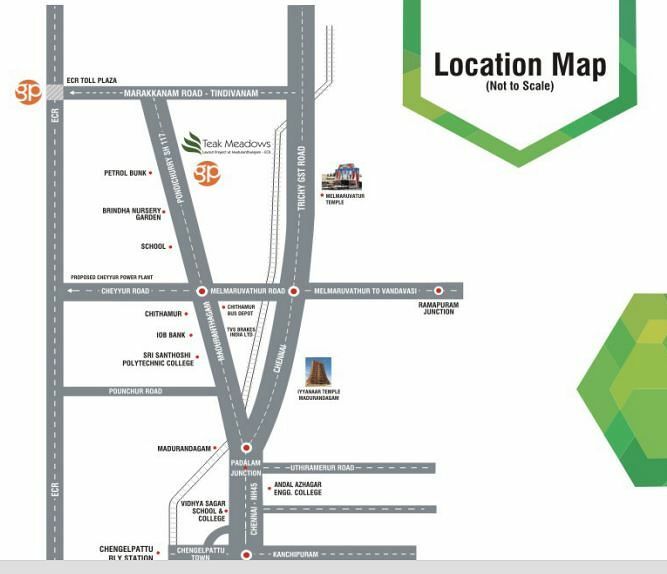 So take a walk with us for a better tomorrow.Teak Meadows, A Gated Community spread over 110 acres of prime land located on main state highway 117 – Connecting GST RD near(Madurantakam, Acharapakkam & Melmaruvathur)and ECR Rd near ( Cheyyur & Marakanam). Free teak trees in all plots* 30 feet well laid roads Entire layout with compound wall 24 hours security A fully operational club house Swimming pool Indoor & outdoor games Cricket ground & volley ball nets Landscaped park Multipurpose hall & many more Club house. Restaurant Resort for stay Volley ball court. Badminton court. Children's play area. Lush landscaped green gardens.